Cafe Barriers are perfect to identify your cafe or restaurant with a sleek, modern look. Using this recycled plastic product as a barrier and sign has many advantages for your work place. The feet of the barrier is a 40mm x 90mm black profile with an angle applied to suit the above measurements. 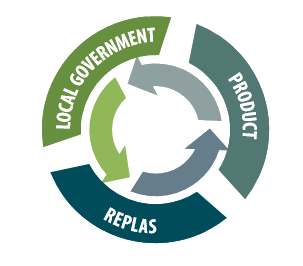 CLEAR = Closed Loop of Environmental Accountability for Recycling Bollard – an easy and fun way to show schools, councils, and many more the effects of plastic and what they can do to help. By re-thinking your selection and procurement of recycled plastic products, you become the true recycler. The Modular Bench is a versatile solution for any area. This bench can be fixed to an appropriate surface or are heavy enough to be free standing. A perfect solution to school and park areas with the ability to move the product to fit the space. A new design made from the same, durable recycled plastic profiles from Replas.